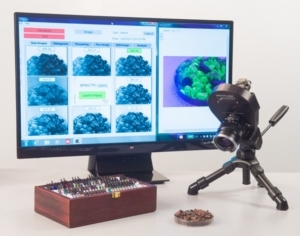 SpectroCam™ multispectral wheel cameras deliver live processed images of 6-8 spectral bands at full-frame resolution and rates up to 25 frames per second (∼2-4 stacks per second). Configure SpectroCam™ for your application, using standard and custom interchangeable optical filters. Available in ultraviolet (UV), visible (VIS), and short-wave infrared (SWIR) versions, our cameras incorporate high-sensitivity image sensors. 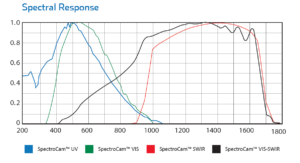 Designed to reduce development times and simplify the design cycle, SpectroCam™ makes multispectral imaging accessible for any user speeding the development and deployment of all kinds of multispectral applications. Capture live images within minutes, using the included acquisition software to enhance contrast and see beyond human vision. SpectroCam systems are available in a turnkey format complete with lens and up to eight interchangeable filters. Customized OEM multispectral engines are possible. Contact our engineers to discuss your application.